Grand Opening Sale At Wilkins RV In Syracuse and Victor, NY Now Until May 22nd! Here at Wilkin’s RV, we are expanding to two new locations so we can serve our RV customers better! Join us for our Grand Opening Sales Events at both our Syracuse, NY and Victor, NY locations. From Now until May 22, you have the opportunity to get an incredible RV at an amazing price! 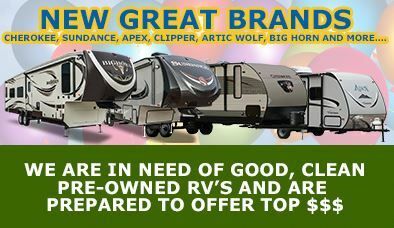 New motorhomes as low as $390/mo. In addition to great deals, we will be offering fun and prizes as well! Mark your calendar for the Grand Opening Event Day on May 20th! Our Victor, NY location will be hosting an onsite broadcast by Steve Hausman from the Morning Coffee Club on WBEE 92.5 from 11am- 3pm. 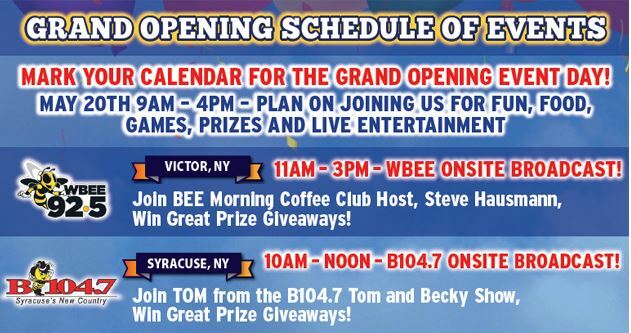 At our Syracuse, NY location, join Tom from the Becky and Tom show from B104.7 from 10am- noon. Both live broadcast hosts will be offering Great Prize Giveaways! 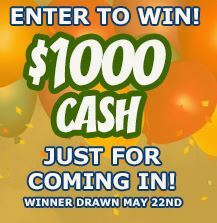 Enter to win $1000 cash just for coming in! Winner will be drawn at the end of our sale on May 22nd! Contact Us at Wilkins RV or stop by and visit one of our new locations in either Syracuse, NY or Victor, NY. One of our friendly RV specialists will help you find just the right RV at the right price!